Scorpaena guttata Girard, 1854, Monterey, California. 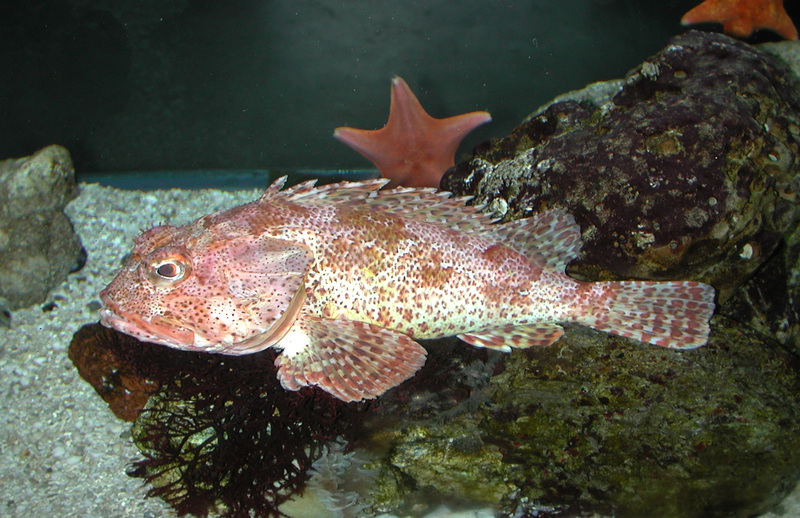 English: Sculpin; French: Rascasse californienne; Spanish: Rascacio californiano, escorpiуn californiano. Reaches 16.5 in (42 cm) maximum length. 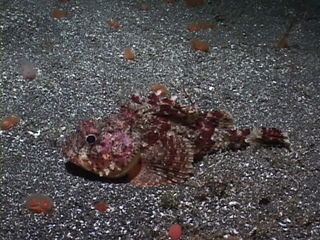 Like most scorpaenids, it is a well-camouflaged, spiny, massive fish. The coloring varies widely, from a deep red through light brown. Black, dark brown, and maroon spots cover the body and fins. Found from Santa Cruz, California, south to southern Baja California. This species also is found in the Gulf of California. These scorpionfishes are most abundant on hard bottoms, particularly rocky reefs, caves, and man-made structures, such as wrecked ships. Additionally, they can be found on muddy and sandy bottoms. 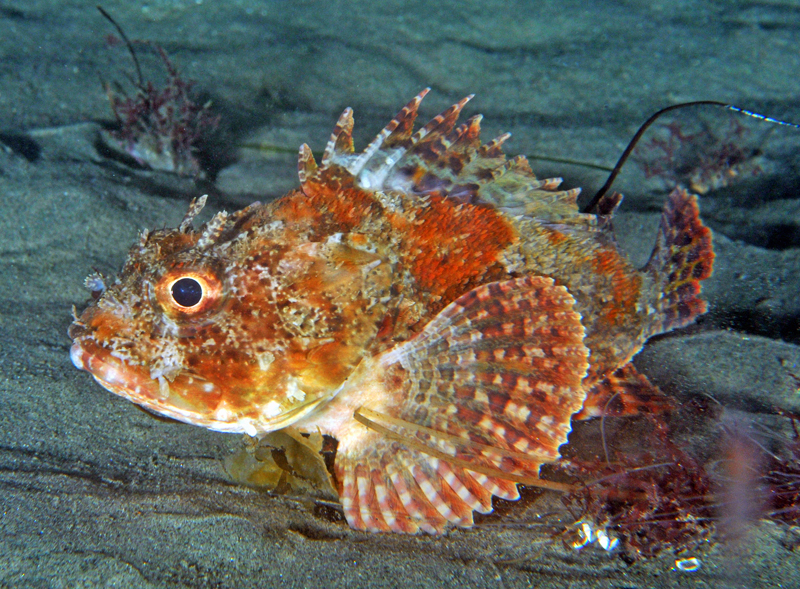 Although most scorpionfishes and their allies are venomous, the California scorpionfish is the most venomous fish regularly collected off the California coast. The diet of these predators primarily consists of crabs, but small fishes, octopi, and other crustaceans also are eaten. 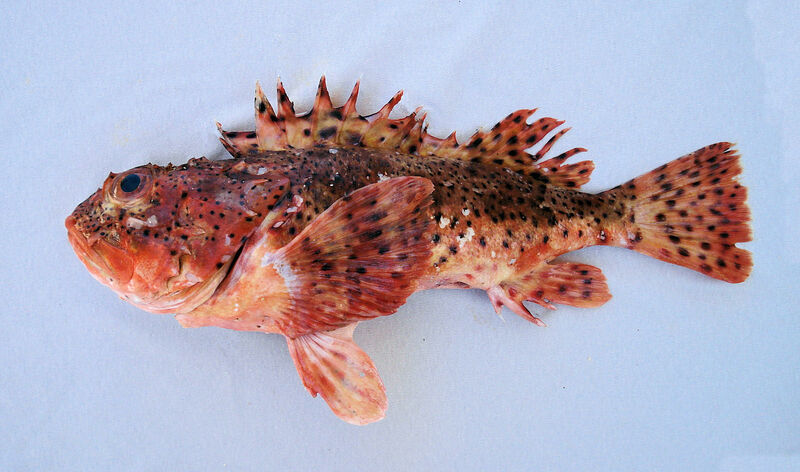 Although the species represents a fairly important fishery, they currently are not threatened as are some of their rockfish relatives. Supports an important commercial and sport fishery in southern California and Ensenada, Baja California. Most fishes are taken in the spring and summer months, when commercial fishermen target spawning aggregations using hook and line, gill nets, and otter trawls.